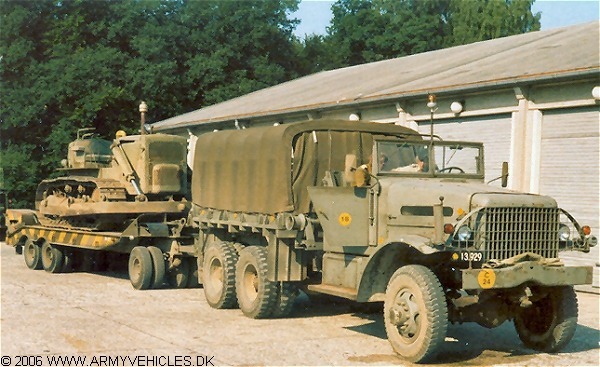 Danish Army Specific: Used in the artillery as prime mover for 90 mm gun M/50, 155 mm gun M/52 and 203 mm howitzer M/55. Also used by the engineers typically with a Rogers M9 trailer as Heavy Equipment Tractor (HET). Here shown with a Caterpillar D7C dozer on the trailer. Some vehicles delivered were manufactured by Corbitt (27 kb). Both types were delivered with open and closed cab. Historical: Designed for the US Coast Artillery and produced from 1941 until 1945 to a common specification by White and Corbitt. A soft-top version (shown) was available from 1942. In addition to the cargo/prime mover trucks there were several derivatives. Co-producers of certain types were Brockway, FWD and Ward LaFrance. Grand total, all types, was over 21.000. Length: 7.35 m (286 inches). Engine: 6-cylinder Hercules HXD, 14.000 cm3 (855 cubic inches) displacement, liquid cooled. Horsepower: 205 at 2.150 rpm. Electrical system: 6 volt (12 volt starter), positive ground. without preparation: 0.6 m (24 inches). Range: 480 km (300 miles). Additional: Winch capacity: 2.700 kg. Earlier models had a 12.7 liter 165 hp engine.